Édouard Glissant opens Poetics of Relation in the belly of the boat. In its horrors. ‘For the Africans who lived through the experience of deportation to the Americas,’ he begins, ‘confronting the unknown with neither preparation nor challenge was no doubt petrifying.’ Glissant asks us to imagine the enslaved, the deported, ruptured from their familiar winds and gods, chained in darkness, dying next to the dead. Imagine, ‘if you can’, encountering the unknown of the ship’s bowels, the unknown of the ocean’s depths, the unknown of the unimaginable shore. This unknown does not forsake knowing. It is the void from which knowledge emerges. ‘This boat is your womb,’ Glissant writes, and you are about to be born. I let Glissant’s words wash over me, underlining this phrase as if gasping for air. He will elide, repeat, interject his own streams, tracing the rhizomatic fibrils of his thought. It frustrates and enlivens. In this way, his writing embodies his philosophy: one of relation and opacity. To write of and from within Glissant’s feverish project requires resistance to the tempting reduction of transparency, for an errantry of thinking that ‘wanders without becoming lost’. Or that moves around an idea like one floats on water, toying with buoyancy, under threat of submersion, rolling at the waves’ pace. The ocean flows beneath Glissant’s thinking. His writings sail across ideas of departure and arrival, the closed boat of slavery and the open boat of migration—that condition of colonialism, which simultaneously romanticizes the voyager and displaces the migrant. In 2015, Poetics of Relation was the namesake and theoretical foundation for an exhibition curated in the Pérez Art Museum Miami, a nod to Glissant’s growing influence within contemporary art discourse (curator Hans Ulrich Obrist is said to read his work for 15 minutes every morning). In one of the artworks featured in the exhibition Superunknown (Alive In The) (2010), American conceptualist Xaviera Simmons grouped 40 found photographs of open boats mid sail. 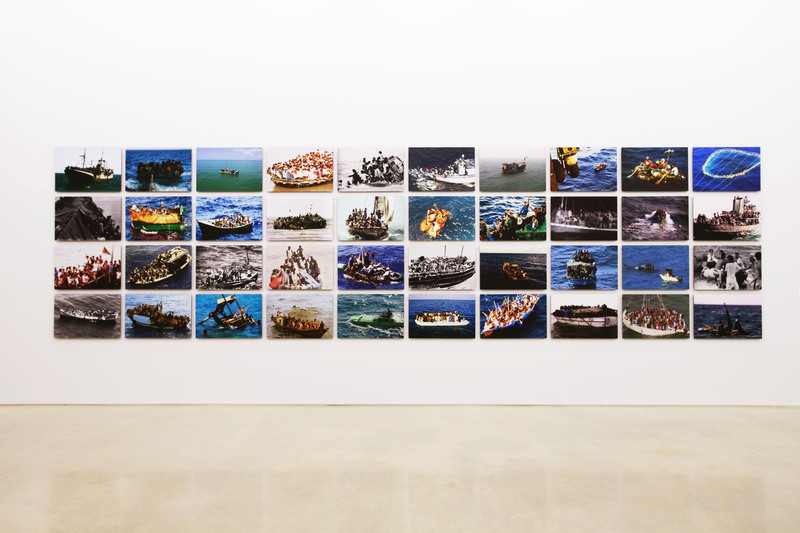 Each boat carried people in search, people who, by setting forth upon the liminal open ocean, became migrants, became a ‘political issue,’ became enmeshed — not in relation, but in a ‘global crisis’. Relation, in Glissant’s work, appears capitalized, as if to underscore its impenetrability. In my notes, I write sentences that thud with blunt inscrutability, such as: ‘Relation is total,’ or ‘Relation cannot be defined, only imagined’. By his own admission, in Poetics of Relation, Glissant circles around his theory, amassing instances that intimate Relation without ever submitting to the fixity of definability. There is, however, one image he offers for Relation’s condition. He writes, ‘Relation contaminates, sweetens, as a principle or as flower dust.’ Flower dust: sticky pollen that affixes, roves, rubs, pollinates, bears fruit. When honeybees return to their hives covered in pollen and stuffed with nectar, they spit the sweet liquid into the body next to them, who swaps spit with the body next to them, who again swaps spit with the body next to them, thickening the soup until they regurgitate honey. This is Relation, too. Diawara dons Glissant, a ‘philosopher of post-filiation’, a thinker who tears at the ‘totalitarian roots’ of legitimacy, instead anchoring his poetics in the entanglement and enmeshment of the rhizome. In botany, rhizomes are plant stems that grow horizontally beneath the dirt, extending roots from their nodes. Picture a ginger root, an open palm spreading its bulbous junctions, jutting new nubs. Deleuze and Guattari proposed the rhizome as a creative and intellectual approach that seeks the non-hierarchal and the non-linear. The rhizome cuts across arboreal conceptions of knowledge stemming from the centrality of the trunk or verticality of a branch’s reach. Glissant, too, rejected the arborescent backbone that shapes how we structure genealogy, organizations or evolutionary history. In Poetic Intention, his second collection of essays, he writes that in Caribbean thought the tree is ‘the upward thrust, the Whole, a density in ferment. When I try clumsily to draw a tree: I will end up with a wall of vegetation, whose indeterminate growth only the skyline of the page can cut off. The unique gets lost in the Whole.’ The finely trimmed tree, echoing the manicured gardens of colonial Europe, gives way to a forest aesthetic bent on chaos and totality. ‘An aesthetics of the earth? In the half-starved dust of Africa? In the mud of flooded Asia? In epidemics, masked forms of exploitation, flies buzz-bombing the skeleton skins of children? In the frozen silence of the Andes? In the rains uprooting favelas and shanty towns? In the scrub and scree of Bantu lands? In flowers encircling necks and ukuleles? In mud hut crowning goldmines? In city sewers? In haggard aboriginal wind? In red-light districts? In drunken indiscriminate consumption? In the noose? In the cabin? Night with no candle? Simmons, I suspect an errant herself, describes how travel, the experience of being in an unknown space, and unknown in that space, ‘helps one to be excited about mystery’. Or, as Glissant celebrates, helps one to clamor for the right to opacity. That we might find hope, even joy, in not-grasping, not-reducing. Reading and working through Glissant has turned into practice for an ethics that displaces all reduction and basks in the impenetrable irreducibility of what is encountered on the other side of the abyss. Artwork: Superunknown (Alive in the), 2010, as shown at Pérez Art Museum Miami by kind permission of David Castillo Gallery. In Which We May Honour Our Boats features in Somesuch Stories 3, now available for online purchase worldwide via Newsstand.